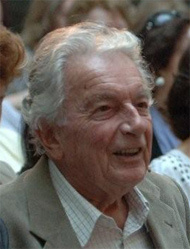 Professor Walter Barylli celebrated his 90th birthday on June 16, 2011. Our former concertmaster and committee chairman was accepted into the Vienna State Opera Orchestra on September 1, 1938, at the age of seventeen, and on the following November 1st was granted membership in the Vienna Philharmonic, where he remained as an active member until August 31, 1972. Following his election as the orchestra's vice-chairman in 1964, he served from 1966 -1969 as Chairman of the Vienna Philharmonic, succeeding his long-time quartet colleague, Otto Strasser. Five years ago, Walter Baryllis' autobiography "Ein Philharmoniker einmal anders (A Different Philharmonic Perspective)" was published, which was not only interesting for the musical recollections of the musician with the Barylli Quartet and the Philharmonic, but which also contains material of contemporary historical significance. The "War Diaries", written together with Walter Weller sen. and Wolfgang Poduschka, is a unique document which describes the most dramatic episode in the history of our orchestra and the fate of the "Volkssturmeinheit Wiener Philharmoniker" during March and April 1945 in the Musikverein, in the cellar of the Burgtheater and the Fire Station Am Hof. Two years ago, a document appeared which portrayed Walter Barylli in a very different context. Preiser Records released a compact disc with Mozart's D major Violin Concerto, KV 218, from a recording made in the year 1944, featuring Walter Barylli and the Vienna Philharmonic under Clemens Krauss. This can be obtained, along with the autobiography, in our ticket offices at Kärntner Ring 12. As part of an Artist Discussion in the "Haus der Musik" on June 16, 2011, with Philharmonic Chairman Dr. Clemens Hellsberg and Vienna State Opera Director, Dominique Meyer, the 90th birthday of Professor Barylli was commemorated in the presence of his numerous friends and fans, among whom was Zubin Mehta. The musical backdrop for this occasion was provided by the "Philharmonia Schrammeln".